Every morning, students and faculty drive to campus in hopes of finding a parking spot. During the first week of school, parking was nothing short of traffic jams, angry drivers and cars circling the parking lot waiting for someone to pull out of a stall. The Center for New Media has indeed brought more traffic to South City Campus. Before construction began on the new portion of the building, there were still a lot of people needing to park in the small lot. Now that the center has opened, the lot hasn’t gotten smaller, but the number of people needing to park has increased. “The first two to three weeks [are] pretty chaotic, but then it clears right out, and we should have ample parking for whoever wants to use [the parking lot],” says director of Public Safety Shane Crabtree. 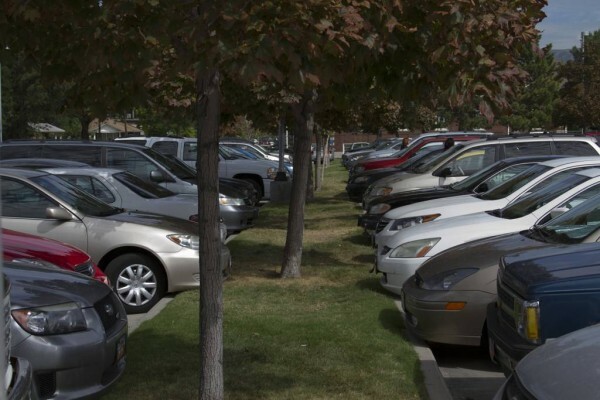 With increased amounts of students and faculty from the Arts and Communication departments, as well as faculty and students from the Salt Lake City School District, there are more people trying to park. Even though it is getting further into the semester, the parking lot is just as chaotic as the first day. Salazar believes the parking situation is not getting any better as time goes on. Construction on the east side of the school continues to move forward, causing even more problems for people trying to find a parking stall. Some students have resorted to parking on the streets and in neighborhoods, then walking a few blocks to the campus. There are several who cross the busy street on the south side of campus, without a crosswalk to get to class. There are plans to build a parking garage at the campus, but construction could take several months or more. For now, there aren’t very many options for people as far as parking is concerned. Students and faculty can use alternate methods of transportation such as the bus or, if they live close, a bike.